Is there hope for the Democratic Party? I believe so. I certainly hope so, as the alternatives appear terribly insignificant at the moment. Given the prospects, it’s probably smart to prepare alternative courses of action, in the event the Democrats are beyond resuscitation. Though I left the party after Bill Clinton steered it toward the never-ending race for corporate funding in the early Nineties, I’ve always assumed it could one day be guided, pushed, dragged or in some other fashion find its way to a far more progressive path, and I would return to the fold. Its current leadership’s “A Better Deal” does not inspire much confidence that my assumptions were correct. In many ways, Democratic Party leadership appears to remain oblivious to just how badly it misread the American people during the last electoral cycle. It continues, for example, to invest significant funds in the search for elusive white Republican voters, while bleeding support from voters of color, young people and the working class in general. 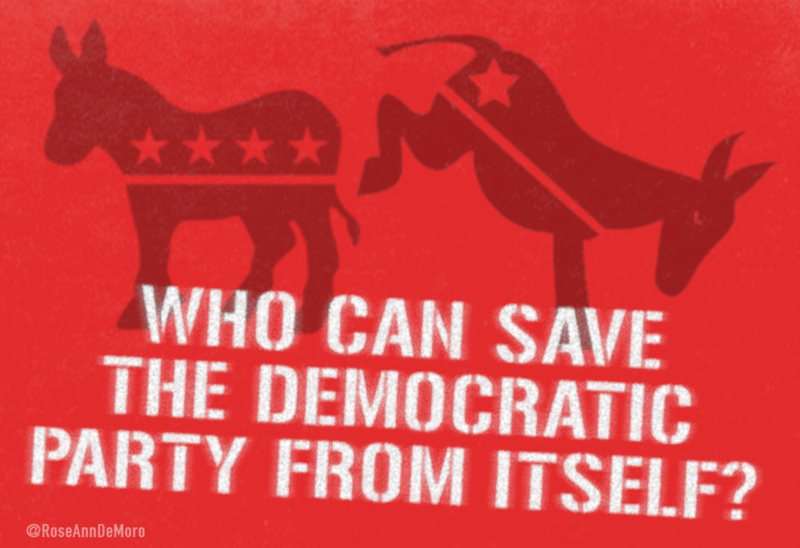 Having invested in little other than being anti-Trump and the Kremlin takeover proposed by Rachel Maddow and much of the corporate press, the party’s current trajectory is alarming to say the least, making critical analyses like the new report, Autopsy: The Democratic Party in Crisis extremely important reading. 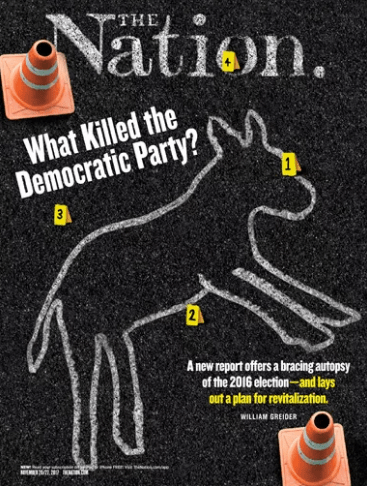 For an introduction to the report, start with William Greider’s piece in The Nation magazine, What Killed the Democratic Party? The voices of the progressive Democrats who wrote the report deserve a good hearing, so please spread the word and further the conversation. 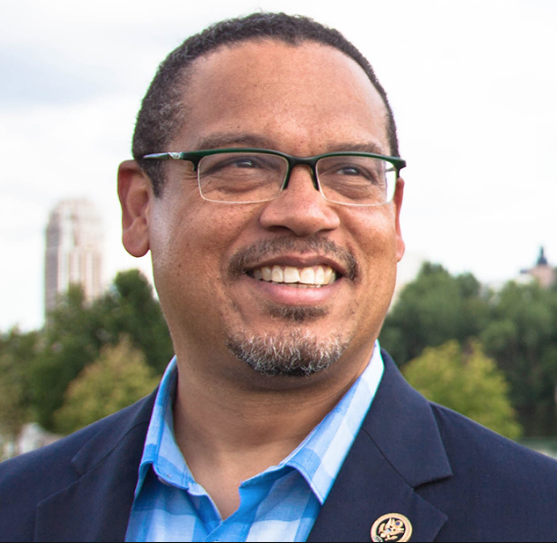 The chorus of Democrats calling for fundamental change grows, now including Senator Elizabeth Warren and U.S. Representative & DNC Vice Chair Keith Ellison. Autopsy was written by journalist and media critic Norman Solomon, a Democratic convention delegate in 2008 and 2016; Karen Bernal, the Progressive Caucus chair of the California State Democratic Party; Pia Gallegos, a longtime civil-rights lawyer and activist in New Mexico; and Sam McCann, a New York–based communications specialist focused on issues of international justice. Read the full Autopsy in PDF form. Keith for DNC campaign image. As leaders of the Democratic Party, it is our responsibility to acknowledge that millions of Americans still feel hurt and betrayed by the events of the 2016 presidential primary. We can’t allow this idea to persist that any candidate has an inside track, because the DNC must be an impartial and transparent organization that welcomes all people who share our core values of economic justice and human rights for all. Democrats will retake power if people truly believe we are a party that values every voice and every American, and that can happen only if our core supporters feel like our nominating process is on their level, and that their concerns are being taken seriously. Donna Brazile’s account cannot simply be dismissed. We must heed the call for our party to enact real reforms that ensure a fair, open, and impartial nominating process in elections to come. I’m committed to working with Chairman [Tom] Perez to make the DNC more transparent and accountable to the American people, whether that’s by ensuring that debates are scheduled far ahead of time or by guaranteeing that the terms of joint fundraising agreements give no candidate undue control or influence over the party. Additionally, when the DNC Unity Commission presents its recommendations on reforming our party, we must listen and act. If we do, Democrats can move forward and retake power at every level of government across the nation. by Howie Klein at Down With Tyranny! 1) What are the DNC’s plans to further accelerate its gear-up of staffing to fight against the multi-front assaults on voting rights that include voter ID laws, purges of voter rolls and intimidation tactics? 2) How can we assure fellow Democrats that the DNC has committed itself to scrupulously adhering to its Charter’s requirement to be evenhanded in the presidential nominating process? 3) What is the status of decision-making as to the voting power of superdelegates at the 2020 Democratic National Convention? 4) In an article published on Nov. 1, 2017 by The Progressive, journalist Christopher D. Cook wrote: “My repeated calls to the Democratic National Committee for comment on the [Autopsy] report went unanswered. When messages left on the main line went unanswered, I called the donations and member services line, where I was sure to get a live person. Stunningly, that office claimed it had no phone number it could give me for press or communications.” Why would a journalist encounter such problems in reaching the DNC? 5) In a recent article published by The Nation (“The Obsession With White Voters Could Cost Democrats the Virginia Governor’s Race,” Oct. 23), Democracy in Color founder Steve Phillips described a disturbing continuation of spending priorities that lavish enormous amounts of funds on ostensibly persuadable voters who normally vote Republican– while relatively neglecting people of color even though they comprise an essential portion of our party’s base. How do you explain such priorities and do you intend to help change them? 6) On May 28, 2017 (NBC News, “Open Letter to DNC Chair: ‘There’s Too Much at Stake to Ignore Black Women’”), thirty-one eminent African-American women, including seven members of Congress, wrote to you about serious concerns: “The Democratic Party has a real problem. The data reveals that Black women voters are the very foundation to a winning coalition, yet most Black voters feel like the Democrats take them for granted. The Party’s foundation has a growing crack and if it is not addressed quickly, the Party will fall even further behind and ultimately fail in its quest to strengthen its political prospects.” In the five months since then, what has the DNC done to address the concerns expressed in that letter, and what are your plans for the near future in that regard?